This is a picture I’ve been thinking about for a long time, and it’s the kind of shot that I just can’t go out and get any time I feel like it. Whenever we take Highway 77 north of town to get to the turnpike we pass this house, and every time we drive by I wonder about this house and what it’s doing there. When was it built? Does anyone still live in it? If so, why is it so run-down? If not, who farms the land around it? I don’t know if I will ever find the answers to these questions and in some ways I kind of like not knowing since it lets me make up my own stories about what’s really going on in inside those walls. I was pleasantly surprised at how the overcast sky and brown grass complemented the run-down appearance of the house, as this image would have taken on an entirely different connotation if shot in springtime, or in the early morning, or on a clear day with bright blue sky. It’s not a creepy photo despite the abandoned appearance of the house, and to me it’s more of a curiosity than anything. I shot at f/4, 1/1500 second, ISO 400 to get the exposure I was aiming for and I think it all worked out quite nicely. I’m curious what you, my readers, think of the house. Not the image per se, but the house itself. What stories come to your mind when you see this house or others like it that seem to have been long since forgotten by the passing of time? When I see a house like this I wonder what newspapers are left behind, and from what era, that would present new insight into the history of area in which it resided… or this great country for that matter! There is always a history of some sort in any abandoned house and someone left a legacy for someone else! Was it a life that projected the following generation to something different enough to abandon it’s roots? Or was this “abandoned” house the prized possession of someone who refuses to let it go! Interesting… and as for the picture; when I clicked on it in flicker and enlarged it (cropping it so to speak), I loved it even more! The detail on the house made the abandonment even more interesting! It’s kind of amazing the stories we can invent for single objects, isn’t it? I got to thinking about a lot of those questions myself as I looked at the house, and I couldn’t help but wonder if someone still does live there or maybe use it as an occasional fixer-upper project. Then again, maybe it’s been abandoned for years and ghosts and other spectres have taken up residence in the meantime. Hmm…. 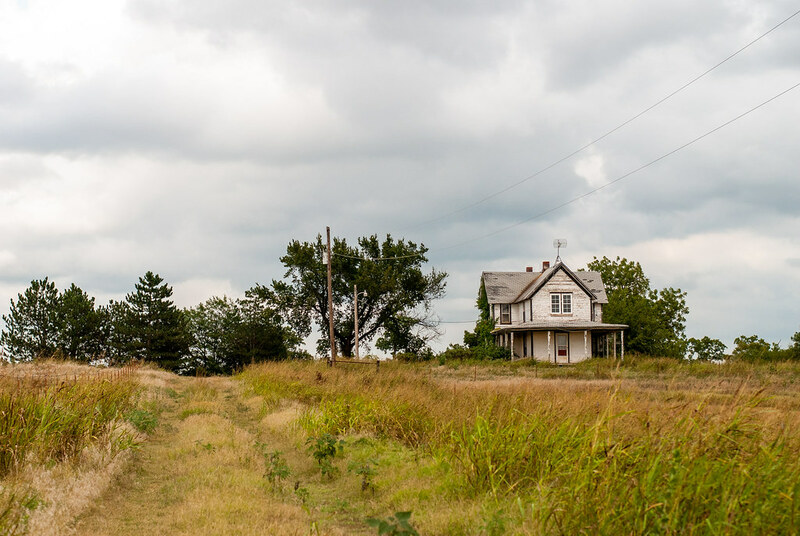 This reminds me of the house my grandpa and grandma lived in just East of Enid. The big yard and the wrap around porch were my places to run and play as a child. I would like to know how to get to this place so I can take photos also. Imagine the stories the house could tell if it could talk. Thanks for helping me re-live great memories! Reminds me of Andrew Wyeth’s Famous painting, Christina’s World. Nicely done! We’re you on Aperture mode or manual all the way? Am still figuring our manual mode not comfortable yet. Simon, I’m a novice myself but over the last few years, I’ve been deliberate about swapping between primes for comparison. The compression of a focal length changes the angles of lines and it also creates a unique balance between the foreground and background. I like the distance that you chose to take and the incorporation of the trail. This is a different feeling than most of your shots. This is landscape. I think of an older person living in this house, doing what they can to keep it presentable. A woman who is proud of this house and the land. She and her husband worked long and hard to make a home for their family. But as proud as she is of the house, she cannot get up on the ladder to paint the second story. She can no longer push the mower or plant flowers. On a meager social security pension, she cannot afford to replace the roof. All of her egg money went to purchase a couple of gallons of paint and to replace the one window upstairs. That new window will keep her warmer this winter as she watches cars go by this hoping one will pull up the driveway. Maybe the next car to go by will be driven by one of her children. When it stops maybe a few grandkids will scramble out and come sit on the porch she fixed up for them. Rebecca, that was beautiful. I never thought of anything like that, and clearly you have a talent for storytelling. Reading what you just wrote makes me think of all the tales left untold inside the walls of that house, and the people who lived there over the years. Almost a replica of Bloody Mary Partington’s house that once sat at 44th and Havelock Avenue, which later became Superior Street. I can still see her seated in her rocker, a sun-bonnet on her head as she smiled and waved at me back on the day I chased her three white horses on my motorcycle to get them back into their corral. I always waved at her after that out of respect for the legendary lady.